One fact needs to be made quite clear at the very outset: the Lubin Baugin who first saw the light of day in Pithiers, France in 1610 was not the same Lubin Baugin who died in Paris fifty-three years later. To be fair, not many of us remain the same person throughout our entire lives. Like cats, most of us have nine lives, more or less seamlessly joined. But some of us undergo such major schisms at certain points that we emerge from them as totally different personalities. As opposed to steady development, such lives represent breakage: one half labeled “before,” the other half labeled “after”. Such a personality was the painter Lubin Baugin. Both halves of his painting career were so stylistically disimiliar that for long periods during the past century puzzled scholars mulled over whether or not “Lubin Baugin” and “Lubin Baugin” were two separate artists. The second Baugin had been a totally mediocre fabricator of insipid religious scenes, the kind that can still be found lurking in provincial churches and museums throughout darkest France (or adorning Catholic calendars). Devoid of people but full of actors assuming extravagant poses, they no longer speak to us, their lack of the humane rendering them mere confections. Not for nothing was this Baugin dubbed “le Petit Guide” by his contemporaries … the little Guido Reni. 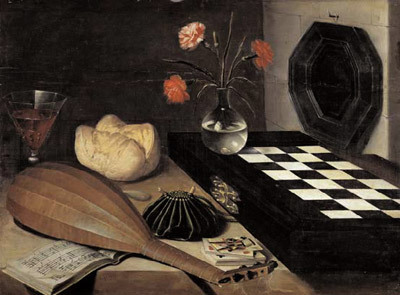 But the first Baugin, who of course inhabited the same body as the second, was one of the most innovative of all French still life painters, albeit one whose importance is now vouched for by only a handful of surviving examples (and some have even cast doubt on the paternity of a couple of those fugitives). Four definites and two probables, these constitute the residual sum of Baugin’s still lifes, all of which were completed by the time Baugin had reached his twentieth year, making him if not quite a child prodigy, then at least an adolescent one surely. And maybe that was the crux of his problem, a dilemma he shared with other adolescent prodigies: an inability to progress beyond his early brilliance. But what brilliance! And what magnetism, for that surely is the one noun most apposite to pinpoint the allure these still lifes radiate. And the North Pole of that magnetism, that hypnotic force which charged Baugin’s still lives, could be found at rue du Coeur-Volant, nestled close by the Abbey of Saint Germain-des-Prés. Fluttering Heart Street, where the adolescent painter lived after he’d departed Pithiers, was an area rife with still life painters. Or at the very least, it was home to several still life painters, at a time when certain districts of Paris attracted specific trades. The still lifes of his neighbors have not survived, which says a great deal about the lasting qualities of a Baugin. To whom Baugin was apprenticed remains unknown. It might even be that the still lifes we now so admire were painted by Baugin in his spare time, as a hobby or a money-making proposition away from the rigors of apprenticeship, or as a rest from painting those historical episodes which probably formed the basis of his juvenile output, along with laborious drawing from plaster casts. Whatever the motivation, the results of his pastime were masterful sleights of hand. The little Still Life with Apricots (c. 1629) is presumed to be Baugin’s first still life, or at least his earliest (and most diminutive) surviving example. It’s also his simplest. Like most of its successors its elements tentatively emerge from nocturnal gloom, as though gingerly being cajoled into the spotlight, center stage. 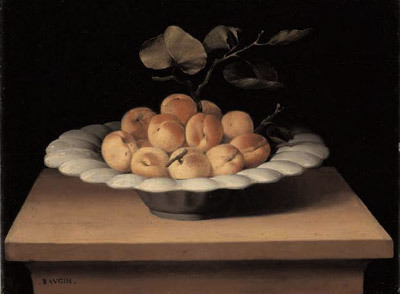 The composition takes as its subject a mound of ripened apricots – a dozen of which are visible – heaped onto a pewter platter, which itself is resting on a plain, unvarnished side table. It’s offered as a gift to the viewer: take one, it seems to beg, since these apricots not only look good enough to eat, they are edible! A fusion of “palette” with “palate” results. What is it that makes this visual invitation so orally enticing, so “mouth watering?” Well, for one thing Baugin has picked the exact moment when this particular cluster of apricots has attained an almost hallucinatory ripeness: only hours off the branch (one of which still stands guard), their bulging spherocity now acquires a tangible cleavage which begs to be squeezed, then lifted. Snug in their fur coats, their soft pulpiness manages to permeate the entire formation. Everything seems bound by similar contours, which manage to be at once containing and yet slightly diffuse, on the verge of melting. Form echoes form. For instance, each compartment around the rim of the bowl, splayed as it is into metallic petals, echoes the apricots’ scissions, while the table itself acts as a kind of palpable gelatinous plinth, its tawny color the result of crushing the fruits’ crimson and gold. Symbiosis follows, with one thing nourishing another, and this process creates a comforting aura of familiarity which our eyes, fingers and mouths find impossible to resist… a gentle riposte to those who insist that painting is only to be looked at. With Baugin’s second known still life, Still Life with Candlestick (c. 1630), we temporarily leave the world of nature and enter the human sphere (though all this painting’s products are the result of man’s utilization of nature). It’s his most challenging geometric endeavor—and a successful one at that—with everything flaring out into space from the focal point of the candlestick. This is especially noticeable when one stands some distance from the actual painting, in the gloomy confines of the Galleria Spada itself. There, the creamy whites which coat the main objects jolt almost stereoscopically from the flat, nocturnal background … the candlestick alone clarifies that all this is taking place at nighttime (it’s a candlestick of the handled variety, the kind one takes up to bed). And it’s these blanched shapes, diagonally shuttling our eyes to the composition’s four corners, which deflect and yet anchor our gaze. Until, that is, we come to our senses and realize that this is not purely a formal exercise but a depiction, too (the former overlaying the latter is one reason why Baugin appeals so potently to modern sensibilities). 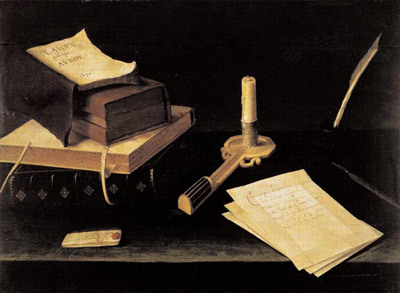 What it displays looks as threatening as an Inquisitor’s night table, and it’s this thread of menace—or simple enigma—which binds all of Baugin’s still lifes. It’s as well to remember (and the candlestick does not allow us to forget) that Baugin’s paintings were executed in those dark ages that preceded the discovery of electricity, a period when life and its activities were geared to the passage of the sun. Come sundown, whatever indoor activities took place were proscribed by guttering candles (for the rich) or fireside illumination (for the multitudes). Hence the gathering gloom which is always threatening to engulf Baugin’s displays, to blot them out, as though the objects had overstayed their leave of absence and were about to be reprimanded. Baugin holds the darkness at bay—just—with an open window. Or perhaps that’s refracted light from a mirror propped behind him? Whatever its source, a subtle, indirect illumination suffuses the platform. By platform I refer of course to the tables, sills or benches on which all of Baugin’s displays rest (prompting the sly query: so just how many still lifes rely on floors as supports, anyway?). And what are these objects temporarily loaned to us by the gloom, objects which act as signposts pointing the way to the edges of the composition? A simple tabulation notes four books, a quill stuck in an ink pot, a knife for sharpening quill nibs, a missive comprising three splayed sheets, the handled candlestick, and an addressed, folded note bearing a red wax seal. We are conscious that a drama may be unfolding, though one without any obvious denouement. This stubbornly reticent world presents us with clues, hints … but no story. Like certain religious or allegorical tableaus whose interpretations are now lost, we’re rapidly shunted back to square one, to a purely formal sighting. The painting can, of course be viewed as some kind of plea or petition, though annoyingly all its calligraphy doesn’t necessarily add up to communication. From the folded letter we can glean, in lieu of a signature, that it is addressed A Baugin peintre/A Paris, and an inscription which might be interpreted as either the address pont n(otre) D(ame), or more likely port 2 s(ols), the postage due. La Voyx publicque au Roy, the topmost volume on the pile of books, was published in 1624, but here bears the date 1630, quite probably the year this still life was painted. A document written in favor of Cardinal Richelieu by François Langlois de Fancon, this pandering screed did not prevent the benighted Fancan from confinement in the Bastille in 1627, where he subsequently expired (in 1630, as a matter of fact). So much for currying favor! Was Baugin pro- or anti-Richlieu? Or are we to construe this as some kind of memorial to Fancan? (His date of demise inscribed on the book tempts one to think so). We’ll never know for sure. Returning to a purely formal interpretation—as we must—it could be that this was simply a book that Baugin happened to find on a bookstall, and used it more or less abstractly, as just one more prop for his assemblage. The letter lying diagonally across from it (which has been received and is not awaiting dispatch – note the mailing creases) takes the form of a petition, reading in full: Ce n’est pas d’aujourdhuy que Jay bien Recogneau que les choses demandees avecq passion sont celles dont on se soucye le Moings. Je lay bien recongnev en vous de qui je nay receu Aulcunes de voz nouvelles … Its addressee remains unknown, likewise its outcome. Our puzzlement is such that we might as well be in a Martian toolshed, where all the instruments have unknown uses. Which may be as good a place as any to finally close the book on this baffling case, to be filed in one of art history’s many drawers labeled “Unsolved Mysteries”. TREVOR WINKFIELD exhibits his paintings at Tibor de Nagy Gallery, New York. A survey of his work from 1994–2008 was held last fall at the Erie Art Museum in Pennsylvania. His collaborative book with John Ashbery, Faster Than Birds Can Fly, will appear shortly from Granary Books. More can be gleaned from www.trevorwinkfield.com.